Kefalonia and Ithaca are two of Greece’s most beautiful and tranquil islands - join us to discover and enjoy this stunning twin-centre walking holiday. 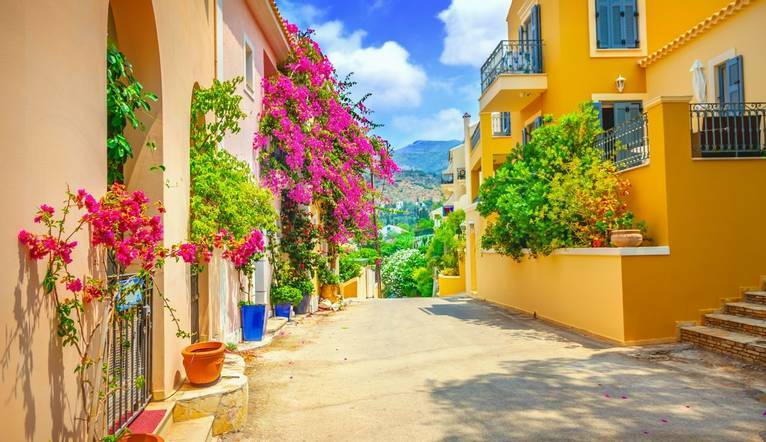 Gorgeous Kefalonia is still relatively unknown to visitors. There’s no mass tourism here, its authentic Greece. The island is simply stunning; high mountains, secluded coves, forests of cypress trees, endless vineyards and colourful fishing ports. Neighbouring Ithaca is an unspoiled hiking paradise, rugged vegetation and only shy mountain goats interrupts the silence. The island is famous as the setting of ‘The Odyssey ‘ by Homer; every traveller should visit Ithaca once and follow in the footsteps of this epic story. We’ll hop from one island to the other on this holiday spending 4 nights on Kefalonia and 3 on Ithaca and we have included 4 walks, giving you time also to relax on these stunning Ionian Islands. We spend our first four nights in Sami, renowned for its clean and sandy beaches and crystal clear waters. Our friendly hotel is right on the beach, so the perfect spot for relaxation. Our first included walk starts at the nearby harbour of Agia Efimia, from where we walk to the abandoned village of Drakopulata where time has stood still since the earthquake of 1953 before a descent down to the coast, with stunning views to enjoy along the way. Our second walk commands amazing views over the Kefalonian coastline, and a chance to see ruins of byzantine monastery which lays hidden in an olive grove. After the short walk to the ferry, we sail to Ithaca for the next 3 nights. Our walk starts at the Katheron monastery in the mountains before we hike to Anoghi and then descend to the picturesque fishing village of Kioni. After lunch we will transfer on to Vathi, the picturesque capital of the Ithaca and our base for the next 3 nights. Here you might like to take an island tour of this stunning island, or alternatively you can relax, sip a frappe by the harbourfront and watch the world go by. Our base for our final night is the island’s beautiful capital Argostoli. The city was for centuries Venetian and Italian influences can be seen everywhere. The central or “piazza” is the place to see and to be seen at night. Our final included walk will show us the highlights of this beautiful city, before our final evening meal will be enjoyed in a traditional taverna – a time to sit back and reflect on a truly memorable week. Everything was extremely well organised, the walks were fantastic and the hotels, staff and food were memorable. Beautiful islands. A well-planned itinerary, with excellent hotels and tavernas and a good variety of walks. Very well organised with an efficient and friendly Tour Leader. Great holiday with a good Solos Tour Leader. Good accommodation and great walks with good local guides. Hotels were great. The people were lovely and the Tour Leader was also very good. Wonderful holiday will definitely go again. I’m so glad to have found Solos holidays! We stay in comfortable hotels throughout as detailed below (or similar). The transfer from Kefalonia Airport to the hotel is approximately 45 minutes. Daily guided walks are included in the programme. Your walking guide will advise you in resort of the daily programme. The walking programme is graded as Medium and you can expect to walk between 7-14km per day, with some ascents/descents and rough underfoot terrain. Should you wish to take a day off from the walking programme - this will be possible on certain days of the holiday and you are most welcome to. This can be discussed with our guides in resort. We wish you to have the best holiday possible.